The author’s spellbinding interweaving of history and today’s world in the small Michigan town of Morgan’s Bridge draws you in for a delightful, engrossing read in Morgan’s Redemption. I cannot tell from gazetteers if the community of Morgan’s Bridge actually exists, perhaps under another name, but it is as real a community as you will ever find. 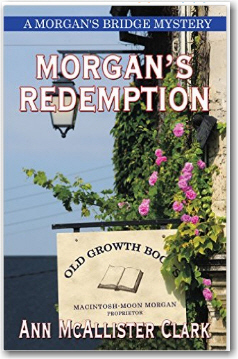 Morgan’s Redemption is definitely a colorful page-turner, even while it is a literary work, not action-driven. It displays atmosphere, characterization, beauty, evil and justice, all of which play against each other. It is a surprising and wonderfully intricate story in so many ways. The plot takes the reader in unexpected directions and people are not always what they seem. Even so, the author does not disappoint us, such as by having a seemingly good person be horrible in the end. The complex good people remain good but complex. You want to keep reading because the characters themselves are so fascinating and well-drawn, whether adult or child. The well-researched historical flashbacks from as early and raw as 1849 are interwoven with current events as Amanda Stimpson discovers more about herself, that she is actually Macintosh-Moon Morgan. As she opens her antique Old Growth Bookshop and gets to know people, she also peels back the layers of her never-met father’s family history. She finds she is indeed a member of that infamous clan. I loved the Mad Mary characters that were drawn from specific generations, from Mad Mary The First down through daughters to Mad Mary The Last. All of the Morgan women had skills and medicinal knowledge used to help the sick and suffering in Morgan’s Bridge. Amanda herself finds early friendship with the newer owners of the Depot Cafe in town who not only fit well with today’s social controversies but can tell village stories with the best of them. The villains scare the bejeebers out of you. So vile, as is their language, but that appears briefly and is totally within context. A person of even reasonable intelligence will grasp why it is there, since vicious people are rarely polite or well-spoken. Characters who stand out apart from the protagonist are blind, obstreperous Willa Morgan, who is full of secrets and specific family stories, and her sweet sister-in-law Caroline, known throughout the community for her loving kindness toward all. The two share a tight bond. I loved reading about the three Wiccans, too. Such a mischievous and kindhearted trio of women, who also reportedly did much to alleviate suffering when doctors would not. The descriptive narrative of specific places in the community of Morgan’s Bridge is amazingly detailed without being overwhelming. I so wanted to linger in Mad Mary The Last’s cottage, on the Crone Cottage Farm that is also a refuge for abused women, in the Three Witches Garden Shop. I went searching for those chapters again to drink in the refreshing aromas of spices and herbs, vegetables, other plants and flowers, folk arts, and farm animals that are not abused. 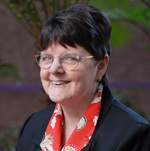 Note: Ann McAllister Clark has a BA in Education from Aquinas College in Grand Rapids, Michigan, and has worked as a teacher, journalist and used bookstore owner. She is the author of the award-winning A Bone in Her Teeth: A St. Augustine Mystery and now resides in St. Augustine, Florida, the oldest city in the United States. Her latest book is Chrysalis: An American Family Endures the Civil War.